1 of 5 Heat oven to 350 degrees . 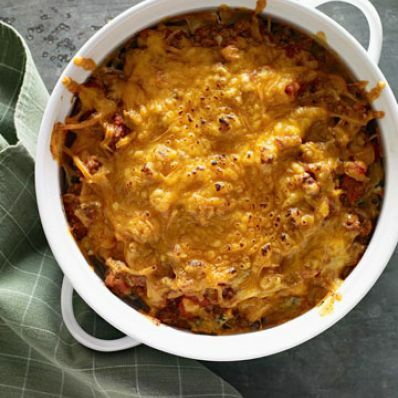 Coat a deep 2-quart casserole dish with nonstick cooking spray. 2 of 5 Bring a large pot of salted water to boiling. Add noodles and cook 5 minutes. Drain. 3 of 5 Crumble beef into empty pasta pot. Cook over medium-high heat for 5 minutes, until no longer pink. Drain off excess fat. Remove from heat and stir in marinara sauce. 4 of 5 In large bowl, combine noodles, cottage cheese, spinach, 3/4 cup of the cheddar cheese, egg, scallions, salt and pepper. 5 of 5 Transfer noodle mixture to prepared dish. Top with beef and sprinkle with remaining cheese. Bake at 350 degrees for 30 minutes. Cool slightly before serving.